Calcification of the uncovertebral joints? I landed on your site after asking Google for help in understanding what an uncovertebral joint was. Why? I happen to be a physician, but not in orthopedics. About a year ago, I had an X-ray of my C-spine while having a workup for some hand tingling and loss of hand muscle strength with pain in my upper back and shoulder. The report reads "calcification of the uncovertebral joints". The neurologist I saw found no nerve conduction problems. So, can you explain how this fits into things? Is that part of permanent cartilage loss in these joints? or just "old" joints? I am 68 yrs young! I learned a great deal from your site; I hope my foramen stay open enough for my nerves to pass through "unpinched". Think I will do some exercises for my neck now which I was told to do every day for the rest of my life (have not). I'm honoured that you've approached a chiropractor for an answer to your conundrum. I too alas am on my 69th orbit of the Sun, three score and ten is just around the corner. The reason I say that is because in one sense degenerative joint disease is simply, like grey hair, or in my case very little hair, a sign of aging. 1. A short leg that gave you a scoliosis; there's more stress on one side of the neck and degenerative change begins. If this is so, look at your children and grandchildren; sometimes a thin wedge in time, in the shoe can save nine years or more of misery. 2. An old whiplash injury that caused a spinal fixation in the lower neck; immobilisation arthritis set in due to the lack of refreshment of synovial fluid in the joints of Luschka. That is what chiropractic is all about. Both are history and the past is set in concrete. Now I would like to suggest a diet rich in natural anti inflammatory compounds; for example the omega-3 in fatty fish and freshly ground flaxseed and the oleocanthal in extra virgin olive oil. Then it's a bit of a ticklish clinical decision whether mobilisation or frank manipulation, or even an 'activator' that is commonly used by chiropractors, would be more effective. Start any exercise programme very gently; it can certainly worsen the situation. Two things to look out for are Spurling's sign and a positive upper limb tension test. Both are to be found by using the site search function at Chiropractic Help. If either are positive in my book you can't simply ignore the symptoms and hope it will go away. Also exactly which fingers are affected? 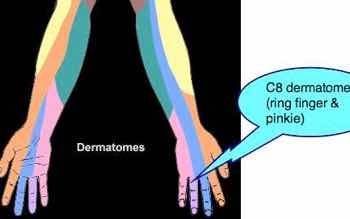 Weakness in the hand is usually C8 or T1. A simple home traction device does wonders for some folk. One last thought; when the tingling in your hand is bad, does raising your arm above your head bring relief, or increase the symptoms? The latter is suggestive of a thoracic outlet syndrome, often caused by a fixated first rib, or scalene muscle spasm. Chiropractic Help homepage»Spurlings test » Calcification of the uncovertebral joints?